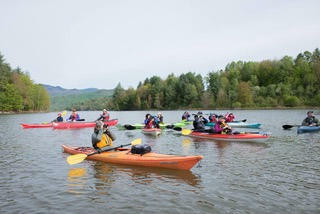 Vermont Fish & Wildlife will host an evening birding paddle at Dead Creek Wildlife Management Area on September 26. Vermont Fish & Wildlife Department staff will lead an evening birding paddle at the Dead Creek Wildlife Management Area in Addison, Vermont, on Wednesday, September 26 from 5:00 to 7:00pm. The group will launch canoes and kayaks in anticipation of finding many of the birds that are present at Dead Creek during fall migration. Participants must bring their own canoe or kayak, paddles and life jackets.